Самая свежая информация мтб банк филиалы у нас. 50 Cent (a.k.a. "Fiddy", "Fifty", or "Farari") born Curtis Jackson on July 6, 1975 in Queens, New York), is a popular African American rapper. Once almost unknown outside his hometown of southside Jamaica, Queens, 50 Cent is currently one of the most well-known and commercially successful rappers of the decade. Because the success of an artist in gangsta rap often depends on street credibility and reputation, Interscope Records has sold 50 Cent as the "real deal". His mother was killed in a drug deal, he was a drug dealer himself, he has been shot nine times, and he built a large rap empire in New York City before ever signing a major record deal. 50 Cent's continued success seems guaranteed by his large underground fanbase and the street credibility he has gained by appearing on almost every major mix tape sold in New York in the past few years. The rapper, who was the first to sign to Shady Records, was scouted before knowing Eminem. He is currently signed to record label Eminem's Shady Records and Dr. Dre's Aftermath Entertainment. Eminem first encountered 50 Cent with MTV News reporter Sway Calloway, apparently having not heard any of his performances before seeing him in person. He then appeared on the 8 Mile soundtrack with an accompanying song and video ("Wanksta") that immediately went into heavy rotation on BET, MTV, and radio stations across the country. Before signing to Interscope, 50 Cent was living with his grandparents. He soon became immersed in the drug trade, hustling around his native neighborhood by the name of "Boo Boo" with fellow Queens native Tony Yayo. In June of 1994, Jackson was arrested on felony drug charges. Being a second time offender, Jackson was able to plead out of significant prison time by accepting seven months in a "shock incarceration" boot camp. He would later boast about this period as his doing "seven to nine". He became a father to a son, Marquise, in 1997. Jackson met up with Jam Master Jay of Run-DMC fame and was signed to his label JMJ. Once Jay had taught him the basics, 50 left the label in search of someone who could help him achieve his dream of rap stardom. He teamed up with the hip-hop production duo Track Masters, who had recognized his talent for incisive lyrics. 50 Cent was signed toColumbia Records in 1999. "How to Rob", the humorous ode to robbing a slew of industry rappers, was an instant hit for New York radio. His debut album Power of the Dollar was never released, due to his shooting in 2000 that Columbia Records used as incentive to drop 50 Cent. The support of Eminem and Dr. Dre. 50 Cent is the Future was heard by a very impressed Eminem who brought the rapper to Dr. Dre's attention. They endorsed the idea of signing a deal and working with 50 Cent on an album. Eminem was quick to get onto New York's hip-hop radio circuit with the message that 50 Cent was his favorite rapper of the moment. After a meeting with Interscope and Eminem in Los Angeles, 50 Cent quickly signed a deal with Interscope. Before starting production of his new album with Eminem and Dre, 50 quickly released another bootleg album of his raps over stolen beats entitled No Mercy, No Fear aimed at rapper Ja Rule. Although the song "Wanksta" was never meant as a radio single, under the barrage of 50 Cent albums and the buzz over Eminem's words of praise and subsequent deal with 50 Cent, "Wanksta" quickly became the most requested song on New York radio. 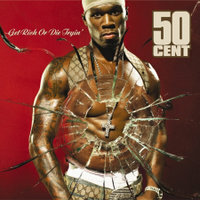 In its first week of release, 50's major label debut Get Rich or Die Tryin sold 872,000 units. The album was certified gold in its first week and platinum the next, and it broke the record for first week sales of any major label debut in the entire Soundscan era. On April 12, 2004 Get Rich or Die Tryin was certified seven times platinum by the RIAA. On March 3, 2005, 50 released the album "The Massacre". It was originally entitled St. Valentine's Day Massacre, but changed when the album release date was set back. He scored a hit with the album's first single "Candy Shop". The album's second single, "Just A Lil' Bit" peaked at #3 on the Billboard Hot 100. After the success of 50 Cent's Get Rich Or Die Tryin, Interscope granted 50 Cent his own label, like his mentor Eminem. In 2003, G-Unit Records officially came into being. 50 Cent appointed his manager Sha Money XL as the president. In 2003, the label signed on Lloyd Banks, Tony Yayo and Young Buck as the established members of G-Unit. In 2004, The Game, R & B singer Olivia, and DJ Whoo Kid were signed to the label. Recently Spider Loc, Mobb Deep, Mase, and M.O.P. joined G-Unit Records. 50 Cent also scouting gangsta crooner Kokane, Jayo Felony and Lil' Scrappy to join the label. After the release of Beg For Mercy from his group G-Unit, he teamed up with Reebok to release his own G-Unit Sneakers. He also invested in bottled water and his own clothing line. 50 Cent guest starred on an episode of The Simpsons entitled, "Pranksta Rap" on February 13, 2005.